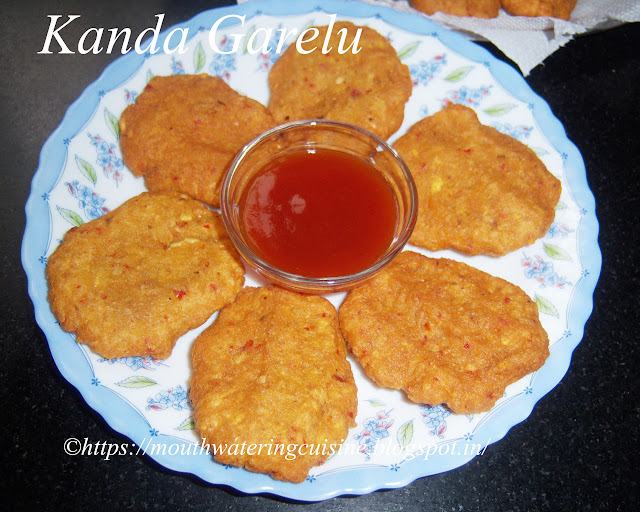 Today I will post here how to make elephant foot yam fritters or kanda garelu. It is another traditional dish among my family circles. It is often served as a side dish with rice. It substitutes curry. But we can have it like a snack also. Today I made it as an evening snack to my kids, served it with tomato sauce. I took the recipe from my mother's elder sister, doddamma. When I was very young she prepared this for me. I still remember that taste. 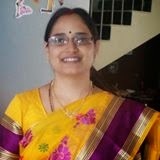 Whenever I met her in any gathering, recollect those memories. We get very rarely this vegetable here in the local market. Whenever I get it,use some portion of it for making curry with bachali kura and some portion for stir fry it. And part of it I use it for making garelu. These are made in two ways, one is soak toor dal and chana dal along with yam, grind it to a paste and make garelu. Another is instant variety, grind yam alone and add rice flour to it and all the spices to it and make garelu. Today I am posting the first way of making it, as it is the most liked by one and all. Soak dals, yam and red chillies for two to three hours. First grind dals and red chillies along with asafoetida and salt. Do not add water, if necessary add very little water. i.e. two to three tablespoons of it is enough. In the same jar grind kanda or elephant foot yam or suran pieces coarsely. To this also do not add water. Mix this grounded kanda pieces to the above batter. Mix it well. Heat oil in a kadai. Take small lemon sized ball of the batter and flatten it with fingers or do it on any plastic sheet. Slowly drop it in the hot oil, do the same with the batter. Drop only as many fritters as we can fry at once. Fry them in the medium flame. Once they turn crispy and become golden brown take them on to the absorbtent paper or kitchen towel. Serve them with tomato sauce or traditionally they are served with hot piping rice.